A few weeks ago, my wife and I took our 17-year-old son, Robert William, to visit several colleges. Over the course of four days, Robert took tours of Georgetown, University of Virginia, North Carolina State University, and University of North Carolina. His favorite out of the four is UNC. (This drives his mother crazy, as she’s a graduate of UNC’s rival, NC State.) That said, when I asked, Robert admitted his evaluation of the universities had as much to do with the attractiveness of the female tour guide as the quality of the education. Take a look at the photo I provided below. It’s a real-life printed student newspaper from 2016! And, it’s a printed paper for millennial readers! What’s more surprising is that the paper is written and laid out by other millennials. Why don’t they just post the stories to Snapchat in 10-second video clips? Those crazy kids today! 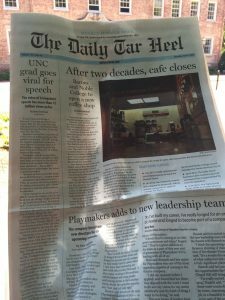 Haven’t the millennials who write, lay out, and print the student news-paper at the University of North Carolina heard about digital publishing? Yes, they have, and they use it. But they also recognize the value the print editions have to their readers. With my clients (and their accountants), I have to repeatedly argue for the benefits of printed publications. I hear all about how people aren’t reading snail mail these days. They tell me how every-thing is moving to digital and there’s no reason to print anymore. I also hear how they only read on their iPad and don’t see why anyone would want to read print anymore. I too love my iPad and prefer reading books on my Kindle over printed books. I recognize the convenience. But if your interest is in turning your readers into a vibrant tribe, than you’ll deliver printed materials. In fact, I came to notice the printed student newspaper racks when our tour guide picked up a copy and stored it in her bag as we walked from one tour location to another. I asked her (yes, she was the cute tour guide) about printed student newsletters. She told me that she certainly reads the student newsletter online. She receives an email each day with the headlines. If there’s a headline of interest, she’ll click to read the article. The paper also publishes 10-second video clips on Snapchat that she enjoys. This is how she stays up to date on breaking news around campus. But when she wants to take a timeout from her day, she enjoys reading the actual paper. She likes looking at the photos and reading the captions to see who is doing what on campus. And, it’s ironic that she prefers the printed edition for the photos, as they are black and white in the paper and in full color online. She’s incorporated the paper into her daily coffee habit. And, she’s not alone. There were racks upon racks holding the papers on campuses throughout our tours. If all you were looking to do was communicate information, there’s nothing more efficient than digital publishing. A text, an email, or an Instagram picture can deliver that information quicker and cheaper than print. 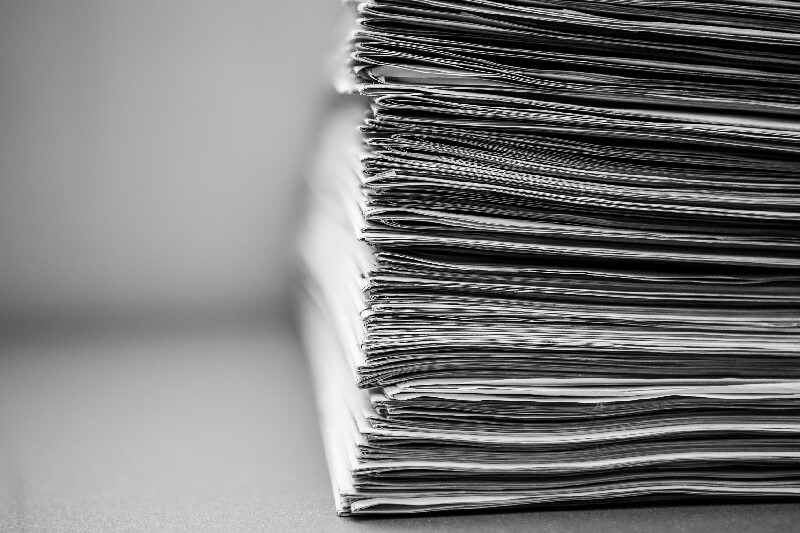 If digital was superior to print, than it would have already eliminated print. In the grocery store checkout line, the magazines would be gone, replaced by screens with photos, headlines, and QR codes, enabling you to download the magazine to your phone. Instead, those magazines are in the checkout line because millions of people each week BUY them. The first week that buying stops is the last week you see those magazines. Print publications are demand driven. Your members prefer print, even if you believe otherwise. Even if they tell you they prefer digital. Offer a digital option if you like, but continue to deliver the print publications. I hope you’ve seen in this month’s Skrob Report that there’s more to the member relationship than the utility of the content you provide. Trading useful information for money creates a fickle member relationship (as they can find information for free online). You build a member relationship by enabling your member think differently about their life. You build a vibrant tribe by connecting people with shared beliefs to each other for discussions and connections. When you see this difference, everything in your business gets easier. Rather than slaving over delivering new content, you recognize how much easier it is to connect members together. Rather than trying to develop the next exciting bright and shiny object, you focus on shared values. And, in-stead of worrying whether your program will grow because you are losing more members in a month than you are getting, you experience the confidence, satisfaction and peace of mind that comes from a strong vibrant tribe of engaged, loyal and referring members.